The Origin boys are on fire at the moment, having secured a sponsorship deal with Roland and with a string of live events and cool productions on the horizon. 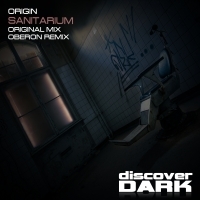 With their latest production for Discover Dark - Sanitarium - its easy to hear why, as they seamlessly blend elements of Psy, Techno, Trance and beyond into their own unique sound which stands like a beacon for all those that want to hear what "unique" and "ground breaking" sounds like. Cue Oberon an remix duty, who not wishing to be upstaged on the originality front throws some moody drum and bass into the equation for yet more mayhem. A superb two mix release that leads rather than follows when it comes to genre!! 'Sanitarium' is available now from Beatport and iTunes.